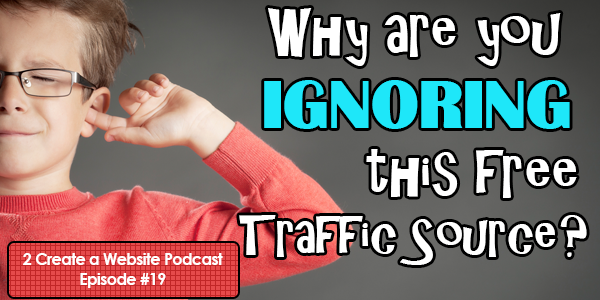 Why Are You Ignoring This Free Traffic Source? For years now, YouTube has been the #2 search engine on the web, yet it’s one of the most underutilized platforms for bloggers and website owners. I cannot tell you how many times someone has emailed me because they are exhausted with trying so many methods of building traffic and when I ask them, “Have you tried creating videos”, I often get no reply. Why do you keep ignoring the #2 FREE search engine online? In this podcast, I share one hidden benefit of being on YouTube that I haven’t discussed. Having a presence on the platform has paid off in ways you might not think of, and you should look beyond the partner income benefits when it comes to being on YouTube. If you aren’t taking advantage of video in 2016, I’m not sure what to say. Listen below or right-click/save-as to download the mp3 file and listen later. Thanks for this. Am going to listen to this podcast later this evening. I keep putting off doing YouTube videos. I’m not very good at public speaking and I think express myself so much better in writing than via me speaking. Might have to reconsider though. Definitely some of the content on my blog would be well suited for YouTube. I did have success with a blog post going viral on Reddit within the past week. Happy about that. Resulted in several hundred unique visitors to that blog post over the past four days as well as a few Amazon Associates affiliate sells. You can always practice and get better. I remember I was very nervous and tense with my first video but it gets easier. So just start small….maybe a short, intro video to get ya warmed up! 🙂 Good luck! Thanks for all the great info Lisa! Do you recommend a specific site to create and upload our videos to YouTube? I edit all my videos in Camtasia 8 for Windows. I have heard you talk about the importance of being on YouTube before, but never thought of it for my new personal finance blog, http://www.moneyfreedomwealth.com. I am now reconsidering. Thanks for all the great content you provide. You’re very welcome Karlene! I wish you the best with your site. LOL! I hear ya, Mitch. While I consider any traffic I get from YouTube a nice bonus, I’d say the bigger benefit is showing your personality and building trust. It’s more of an indirect benefit that can be hard to quantify sometimes. Ha ha ha! Yes, Phil. GET. ON. IT. Glad I could motivate ya! Day one? Wow! Long time supporter. Thank you, Sterling. Just a brief note: I have subscribed to your information blog and have signed up for a couple of the Lisa Urby Udemy courses all of which are interesting and informative. Thank you. I have retired recently and will be starting a new business with a blog on gardening and sales of ornamental garden products. I will be utilizing You Tube to help promote this business. Thank you for the insight. Your presence on the web is a breath of fresh air, always helpful and encouraging. Personally, my most frequent roadblocks to achieving results are in the arena of organizational skills. Thanks again Lisa! Jed you aren’t alone with the organization. It’s NEVER been my strength. So I hear ya on that! Thank you for purchasing my courses! I think this may be the answer. Not at all. Podcasts are hosted on Libsyn so using data has nothing to do with it. Hi Lisa! From the day I began – Yoitube has been my main source of traffic. I can’t believe that bloggers are not utilizing it. I had no idea! It is how I got on the map. It’s how I generate my traffic, show my value and build my business. Thanks for what you do. Yes, Kathy! There are so many benefits beyond the partner program and I feel that’s what draws people in. In my opinion, it’s one of the least important reasons to join. I think it helps build trust and personality for your brand. Just wondering will you be doing podcast on a certain day ? There are a few YouTubers who I watch regularly and I know when to check for their video because they have a certain day to post a video.